How to use "Gaming" plugin? Android Studio log says: "MenuScene.lua.jet:178: bad argument #1 to 'login' (Gaming expected, got no value)"
So, what should i pass to that login method??? And am I use plugin correctly? The API for each plugin can be found in the install.html file. It works both ways; you use the Gaming class directly, I use an instance of the initiated class. If you use the Gaming class directly, you have to always send the instance to it as a first parameter. This can get confusing, which is why I prefer to work with the instance instead. The "param1, param2" from the docs indicate there may be parameters per specific network. Google Play doesn't require a parameter for its login method. I copied and pasted the API because of your "Again, wasted a lot of time to find out how to use this plugin, cuz no docs" comment. Maybe the documentation could be like not named "how to use this plugin" instead of "install"
And i know about those "install.html" files in "All plugins" folder, but those docs could be a little bit better than it is now. Dot and colon - two different things. And of course, fix the installation part, cuz it dint help much. Oh, and btw, can someone explain how to show multiple leaderboards? I have 4 (because 4 difficulties), and i want to load menu (from GP services) where player can select one of four leaderboards. Right now, i can show only first leaderboard (well, i can pass the id to "loadScores" method and load any other, but that's what i don't need) . Is it possible? @antix, yeah I agree it could be easier to find the docs. I reckon after the automated export plugins work properly, each plugin should be added to the official docs online, with code examples. @rrraptor, the Gaming.login() and instance:login() is a Lua thing (rather than a Gideros thing), and it has confused me no end over the years. Starting to half-understand it now, buy it's still confusing. Not sure I understand what you mean about "choosing your score". If you're looking for a drop down to select the score, or just four buttons, that's something you have to code. And as for choosing high scores in general, iOS recently removed the functionality to display specific high score tables, so it would only work on Google Play anyway. If you want to manually load the scores for a specific table and manually display them on screen, that's still possible with loadScores(). I believe that it was made by using GP services. If you just leave the ID parameter blank when calling showScores() Google Play will display all high scores in the order you set when you created them on the Google Play dashboard. As far as I know Google Play don't allow you to add high score boards into sub-categories. Nope. It didnt work. App just crushing. If you still want to use the Gaming class directly, instead of using its instance, you have to include the instance as the first parameter; Gaming.showScores(googleplay). I would recommend using the instance instead; googleplay:showScores(). can i use googleplay plugin api method from the gaming plugin (googleplay) instance? With the Gaming plugin, you have to use its abstracted API. I believe to load scores there is a loadScores() method. @totebo actually i want to get the player high score from the leaderboard and then save it to local if the player had played it before. based on the reference doc looks like it will get all the score, but i only need the current player score just like this method does (googleplay:getPlayerScore()). any clue for that? I'm afraid not, although I did do this on one of my previous games. I think I used the separate plugins for iOS and Android to make it work, rather than the Gaming plugin. Guys, in 'Gaming' plugin there's achievements functionality. I don't see how to create achievements? If we don't create, then what achievements does it load? Something global from Google Play? 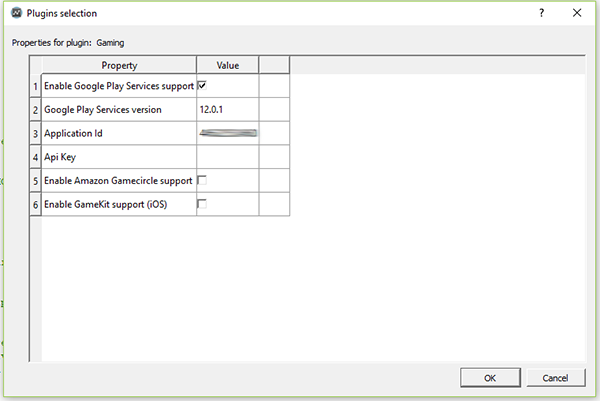 We can't test googleplay gaming services on Gideros Android Player when package names differ? Then I've exported Gideros Android player with package name "com.strongsun.gplayer", that I've written in the console. But I'm receiving the same "LOGIN ERROR:	Could not sign in". What else do I need to do? 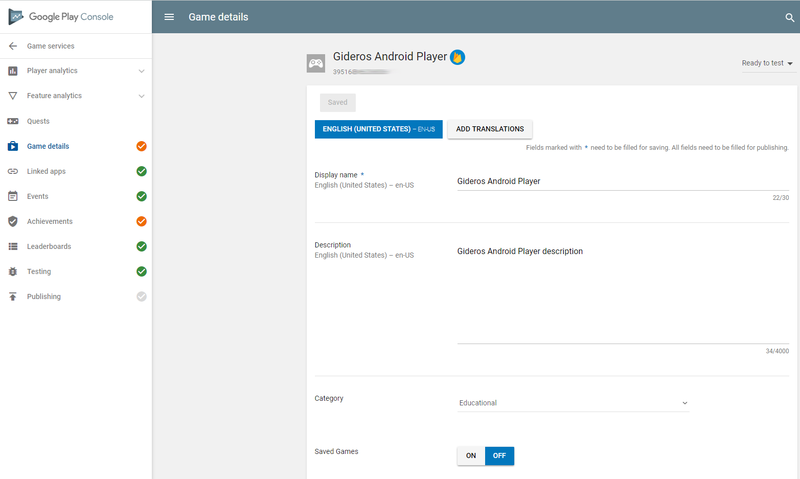 Upload gideros android player apk to developers console? You need to upload an apk to google play, it can be an alpha. 2. Enable Google drive in the Google Play console. I had to do this to make logins work the other day. Mysterious and undocumented. 2. Enable Google drive in the Google Play console. How do you do that in google play console ? Bloody good question. @antix can you remember where you get to this option? I found this documentation. Maybe it will help.